When the first human beings evolved, they were distinguished from their predecessors by many things- an apposed thumb, a higher voicebox, an upright posture and gait, and a bigger brain being among the main differences. The unique combination of factors resulted in freeing the hands to do more tasks with increasing skill, development of speech and language, and an advent of reasonable thought. Naturally, human beings began to give thought to the phenomena around them. Trying to find out why these things happened. One could say this was the precursor of scientific temperament. Science has two main elements. Explanation-the reasoning behind something that happens, and verification- going on to prove this reasoning to establish a theory. To quote this very clearly explained article, "Not only does science propose answers, it proceeds to test these answers, and if the answers prove incorrect, they must be rejected or modified. Mythology differs from this. A myth offers an explanation that is to be believed. Acceptance, not verification, is what is called for." So myths developed from a need to explain things. The explanations translate the unfamiliar and therefore fearful phenomena into the familiar, making them easier to understand and assimilate. The forces to which the phenomena were attributed developed a persona over a long period. Since human beings knew themselves, and their own likes, dislikes, feelings, intentions and actions best, the mythical creations took form of persons behaving much in the way human beings do. Also, since human beings then lived in close proximity to nature, these elements also got incorporated into myths where we often have changes of form between animals, trees, and gods /goddesses. Since early humans considered procreation- the creation of a new human being from the body of another-as the biggest miracle- the female of the species was considered to be very powerful. So all early cultures had myths about goddesses...power in the feminine form. The specifics vary from culture to culture, but the concept is the same. Recent work at National Geographic points to a common ancestor for all human cultures, and this is probably why myths from diverse cultures are similar in essence, also pointing to an even earlier beginnings of mythology. So much for the history lesson. And now for our book. Do you know that the Japanese believe that there is a goddess called Benten at the bottom of the sea, in the form of a sea dragon, and that she quietens the deep-sea serpents who create earthquakes beneath the Japanese islands? Or that Echo was a mountain nymph who was such a chatterbox that Hera, the queen of the Greek gods, angry with Echo for distracting her, punished her by taking away her voice? Thereafter Echo was only able to repeat the last syllable of anything she heard. Or that Fortuna, the Roman goddess of fortune, was blind, and made decisions based only on intution, as she could not see what was actually happening? Or that Gaia was one of the oldest creation goddesses, and was worshipped as Mother Earth by the Greek? Or that Nu Wa was a Chinese goddess, who created humans in her own form, and made equal number of males and females, so that they could then create more of themselves? Or that the Maori goddess Papatuanuku symbolised the Earth, who, with the Sky god Rango, gave birth to the sun, moon, animals, plants, and all creation? And that even now the two are still looking at each other? Or that Hel was a Scandinavian goddess of the underworld, who rode on a black horse every night, calling out the names of those who would die of old age or disease before dawn? Or that Estsanatlehi, the Navajo goddess of time, magic, life, death and immortality walks towards the east when she begins to age, until she meets her youthful self walking towards her? Or that Ix Chel is the Mayan goddess of the moon, who bestows fertility upon women, and who brought the art of weaving cloth to humans after learning it from a spider? Or that Roman women who were childless prayed to the goddess Juno, who ruled over anything that had to do with matrimony and childbirth? Or that Nike was a Greek goddess whose name means victory, and that she wore a wreath of laurel leaves on her head- still a symbol of success? 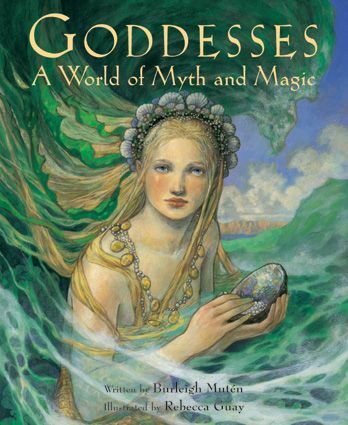 As we go through the book, which has about 100-odd stories about individual goddesses in nugget form, we realise that across such diverse cultures as Norse, Greek, Mayan, Chinese, Hindu, Native American, African, Eskimo, Aborigine, etc., there are similarities in the goddesses they tell us about. In most stories, the goddesses were also considered the all-powerful supreme beings, often against formidable odds. Many of the goddesses have much to do with creation, childbirth, matrimony, fertility, home, hearth, health, happiness, justice, peace, success, arts /crafts, sports, etc., as also with natural phenomena like the wind, rain, thunderstorms, earthquakes, rivers, lakes, seasons, phases of the moon, day /night, life and death. A lot of these myths have religious overtones, and in many parts of the world following polytheistic faiths, many of these goddesses are still being worshipped, and are believed to have power over the fortunes of those people. Here, in India, we have just concluded the 9-day festival dedicated to goddesses- Navratri- which is celebrated in as many different ways as there are cultures in this wonderfully multicultural country. Those in parts of the world which now follow a monotheistic faith consider them just that...myths. Some, like those about nymphs and spirits have now become part of folklore in the form of fairy tales, and are primarily classified under children's stories. This does not, however detract from the fact that these myths, and the stories that abound about them, remain a valuable cultural heritage. The author, Burleigh Muten, who works in the field of empowering women and girls has brought to us thousands of years worth of feminine mythological stories literally in "a nutshell." In her introduction to the book, she says, "The strength and power of goddesses continue to inspire women and girls all over the world...I wrote this book with the hope that you will discover how adventurous and powerful woman deities have been for thousands of years. Maybe you will find one or two or three or four who remind you of yourself." The book is beautifully illustrated by Rebecca Guay. The picture on the cover gives a foretaste of the full colour illustrations inside. With classical intertwining vine patterns framing each double page. The book can be read on many levels. It can become a one-stop reference to the many goddesses in mythology. Each goddess story can stand on its own. There can be comparisons made about similarities between goddesses from diverse cultures. There can be drooling over the fascinating imagination and imagery about every myth. We get a peek into the sensibilities of diverse cultures, and the living conditions and beliefs in ancient times, as by their very nature, myths reflect reality. We get a feel of how people made sense of their surroundings, and what they expected out of life. Most important of all, it can be a wonderful picture book for children that can be dipped into many times, bringing them many wonderful stories full of fantasy and adventure, which can be layered at every reading, teaching them many things as they grow with the book. I am borrowing it from you first. For myself to read. maybe a bit too much for Anush. BTW I also have your Tara Art book remember? It is interesting isn't it that there is a lot of similarity between various myths spread across various regions? for eg., thunder god is always seen as a male God, where as, earth is seen as a Goddess. Sandhya, this is so beautiful. "A myth offers an explanation that is to be believed. Acceptance, not verification, is what is called for." Also beautifully tied the concept of woman power with Navarathiri. AWESOME pick and review Sandhya! On a tangent possibly - when does history become mythology? Only when magical/supernatural elements come in? For example, take Hindu mythology. A non-believer might say Lord Rama was a prince, just and brave, like Emperor Ashoka and it was his subjects/admirers who brought in the supernatural twists to the story. So would you call the Ramayana history (because it does tell us about life in ancient India) or mythology or both? Awesome Sandhya. I'm partial to godesses myself. It does sound advanced for a 5 yo but htis is something to bookmark for the future. Fascinating Sandhya! I liked how the author nudges us to find a few to identify ourselves with. Elaborate and informative, thanks fot this review. @Artnavy: Sure. Maybe I can get the books you want over to Chox' post-CROCUS ST meet? At the same time when I raid her shelf? @Satish: Yes, that is just the most fascinating part about myths- the way they are so similar across various and apparently distant cultures- and yet different enough that they can be identified as coming from that particular culture. @UTBT: Thanks. 'Beautiful' is an apt word for the book- the illustrations, the way the stories are told, and the beauty of each goddess in her own way. After all, even Kali- as told in the book- the goddess who is equated with ferocity is also the "protective mother who cures disease and calms fears of those who worship her...many Indian people still hang Kali's picture in their homes to help them conquer their worst fears." Good question. This is one that A has asked me, and we had a very interesting discussion. History-is usually an authenticated account of what happened, and is usually something that has a written account, or artefacts found from the period- which can be interpreted re the actual events, or research that proves certain theories. For eg- how do we know that human beings came from one source- the Geneological Project by National Geographic where DNA of people from across the world were tested, and genetic markers were found where we can see that there have been evolutionary changes in response to the environment, but the entire DNA mapped is essentially the same- and comes from a single source, which has now been identified as the area around the north-eastern part of Africa. Or, for eg., treasures found in the pyramids of Egypt were legendary and we had people desperately searching for them-until one day they found them- trasforming myth/legend into history. So, the same as I said in my post- science v/s myths. So we have actual accounts of Emperor Ashoka, even if he lived more than 2000 yrs ago, and artefacts from the period- so it is history. Prince Ram- it is possible there was a king like him, who had to fight a battle with a wicked king who stole his wife- there are many ifs and buts about the actual period in which he was supposed to have lived. He was probably a wonderful king, leading to storytellers tell his stories over and over again through the ages, embellishing them with fantastical events, adding the philosophical angle, giving him a godly stature. No doubt he was great enough to include him in the mythological Dashavataram. So- we have mythology. Even around the historical facts of Ashoka, we have many myths and legends, especially as the period coincided with the period of Buddha and the myths surrounding him. Probably the same with the Mahabharatha- which Gurcharan Das has beautifully de-constructed in his book-"The Difficulty of Being Good." Long comment. I only hope it answers your Q. @Poppy: Thanks. Yes, this may be a bit much for a 5yr old at one go, but it could be a nice idea to take one story at a time and indulge in a bit of your wonderful storytelling? @ssstoryteller: Thanks, and great to have you comment. Yes, books on mythology are wonderful, aren't they? @Meera: Yes, it is wonderful, that. We had A here try to do that, and came across some very interesting self-assessment! @Sheela: Thanks. Yes, I noticed that your pick on Ballet had a book illustrated by Rebecca Guay, and it brought a smile. @Tharini: Thanks. We found many such lovely nuggets in the book. Too many to include in a review. Many about Indian goddesses, too, which are so much more familiar. Just to add to my mega-long comment, Chox-what I have put forward is a rationalist's view. As far as believers are concerned- it is always good to find an anchor, a point of faith, that gives one strength for anything, and isn't that the reason these myths came up in the first place? So we can have Prince Ram who was a great and good king, who was revered, and whose life is told about over and over again, or we can have Lord Ram, whom people consider god, and who is believed to destroy fear and evil. I’d say mythology is in between history and religion in the increasing order of intensity of belief/faith! Love the passion with which you have shared your views and ideas. Will check it out. "One could say this was the precursor of scientific temperament." - very nicely said, Sandhya! Mythology in general is a very complex phenomenon/ aspect of human society that can be interpreted and approached from different perspectives, fields of knowledge, and viewpoints. For centuries, the body of myths and legends across different cultures provided a basis, reference point and answers to humans regarding so many questions. Their status in history and contribution to humanity is at least as important as science, if not more, isn't it? I love how you neatly tied in the review with Navarathri theme, a festival close to my heart. When we visited Hawaii, we were introduced to Madam Pele the volcano Goddess and the many rituals that accompany appeasing her. The various Goddesses seem to be representations of the traits typical in women - both positive and negative, eg: intuition. @Prabha: Thanks. True, myths and legends served the very important functions of answering the why and how questions regarding everything and provided a very useful and reassuring sense of continuity to any culture until science in its present form came on the scene. So I would say it can be put nearly at par with science. @Kodi's mom:Thanks. And that is a great angle- goddesses representing feminine qualities. As we now know, these qualities are often shared by the male of the species. And vice-versa. Again, I would like to point out that we already had the Ardhanarinateshwar here in India! What a great pick and a detailed review Sandhya ! Loved the various little bits of information you have given here...would love to read this book myself.